Model 1000 with barrel on 3 point hitch. 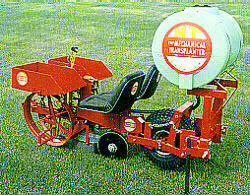 Includes float wheel drive system, 60 gallon poly barrel, single row toolbar, 3 point hitch w/barrel mounting, fiberglass seats.NEW DELUXE HIGH PERFORMANCE UNIT with our PATENTED FLOATWHEEL DIRECT DRIVE SYSTEM now standard equipment The Model 1000 Unit will increase planting speeds by 15-30%, and the Float wheel Direct Drive provides uniform accurate plant spacings, precise depth control and proper soil firming. Std. features include: a 12 pocket chain, automatic water valve, rd. point shoe, steel packing wheels, two fiberglass seats and clamps for 2-1/2" or 4" x 7" toolbar (specify). Adjustable packing wheel axles eliminate the need for strawberry extensions. wt. 450 lbs SHOWN WITH OPTIONAL CUSHION SEATS AND DOUBLE DISC OPENER.